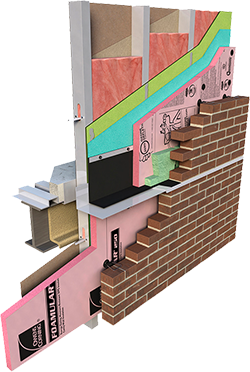 Owens Corning EcoTouch PINK Fiberglas Insulation with PureFiber Technology is a preformed, flexible blanket insulation. It is available unfaced, or faced with either a kraft or foil vapor retarder. The surface burning characteristics of EcoTouch® Insulation were derived from products tested in accordance with ASTM E84. This standard is used solely to measure and describe properties of products in response to heat and flame under controlled laboratory conditions, and should not be used to describe or approve the fire hazard of materials under actual fire conditions. However, the results of these tests may be used as elements of a fire risk assessment that takes into account all of the factors pertinent to an assessment of the fire hazard of a particular end use. Values are reported to the nearest five rating.